This romantic view of the East has been apparent since Mozart’s ‘Rondo al la Turk’ and before. Even the oriental influences on Debussy are responsible for propagating the myth of an “Eastern Paradise”. In other words, the value of these ethnic musics is ‘spiritual’ and not musical (formal/technical?). This may be the reason why many people have believed Western music to be “soulless” and “overly intellectual”. That Western society has become too “technological” and “mechanized”and thus that we have become victims of our own creations. 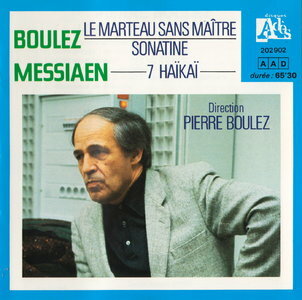 Boulez specifically dislikes the superficial way in which Eastern musical forms and ideas have been used in Western music. Is he talking about Olivier Messiaen or the Beatles? The Beatles were accused of going on a joy-ride on the back of Eastern mysticism and music and of accepting only its “surface” elements: e.g., kaftans, sitars, yoga and mind-altering drugs. Could these criticisms also be aimed at Cage, Messiaen and Stockhausen? All of these composers have used and adopted ideas from Eastern music and philosophy without also accepting the whole show.